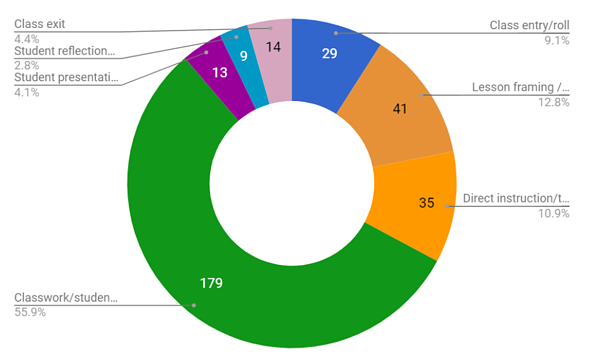 This blog post was originally published on the CompetencyWorks website, based on data from former Ed Elements team member Mike Wolking. Mike Wolking, currently completing an Axford Fellowship, sent me a summary of a short investigation he completed in how a student spends their day. He followed a student in a New Zealand secondary school for a day and tracked her activities. As I read through the summary, I thought it might be a helpful way to begin to think about the quality of personalized, competency-based education. This type of data could be useful for reflection and opening up conversations about where there might be opportunities for strengthening instruction, assessment, and learning experiences as well as identifying where operational policies or organizational habits are getting in the way. One would have to also consider the question: How do we think a student should spend their time in order to optimize learning and development? 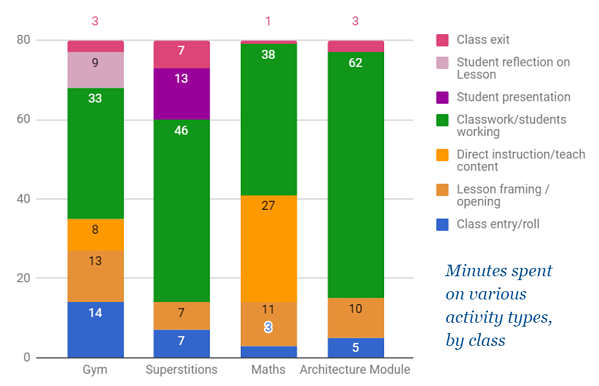 Wolking tracked the minutes spent on entering the class, opening the class and lesson framing, direct instruction, student working on learning activities, student presentations of learning, student reflection on learning, and exiting the class. I’d probably want to add student talking with teacher individually or in small group. He then compared the way the student spent her day across subject areas. He also tried to capture the level of rigor (in terms of depth of knowledge) at which a student was working. What I found absolutely fascinating is that once the data is presented visually, it’s easy to start thinking a bit more micro. How might a teacher use entry and exit time the most effectively for learning? During the time a student is working on learning activities, how might we use the science of learning better in terms of managing cognitive load, moving to long-term memory, and retrieval? How is direct instruction organized so that students are actively engaged and teachers have opportunity for formative assessment as part of the instruction? Wolking also included an assessment of policies that shaped the student’s day: what defined what she should be learning; at what performance or grade level she should be learning; the curricular resources she needed to use; and the technology that was used. When and where students have some control (choice) over their learning (where they sit, how they learn, how they demonstrate learning). When students get feedback on their learning (from students, from teachers, from an educational software program). How many questions did the student generate? In what way did a student advocate for themselves and seek help? I’d be particularly interested in seeing how the data generated from this type of investigation might vary for students who are considered high achievers compared to those who may have significant gaps in their learning or are perceived as not caring about learning. There are at least two caveats about the value of this type of research and reflection. First, a snapshot of a day tells us little or nothing about the actual process of learning over time. It doesn’t tell us how the teacher formed relationships that ground learning. It doesn’t tell us how the teacher created a culture of learning. It doesn’t tell us about all the thinking and prep work that teachers put into place before the student walks in the door. And it doesn’t tell us how a student is developing the Building Blocks of Learning (growth mindset, self-regulation, metacognition, and perseverance, etc) or where they are in the midst of learning new skills and concepts. Second, one day in the life of a student may not reflect the overall learning experiences. Schools organize how they offer deeper learning activities in different ways, some setting aside time during the year. If you follow a student when they are planning for a project, their day might look substantially different from when they are in the midst of doing the project. What do you say? Could understanding and looking at data on a day in the life of a student lead to higher quality personalized, competency-based education? For certain it would lead to the rich conversations about learning that we want to see taking place in schools. Co-Founder CompetencyWorks and Philanthropic Strategic Advisor. Chris is also a writer and consultant with expertise in philanthropy, education and youth issues, and community engagement.